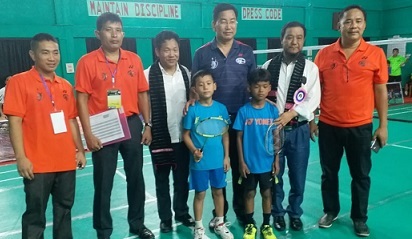 Top seeded Laa Tukum defeated his closest rival Sonam Tamang in straight sets of 21-13 and 21-9 to be crowned the Under-19 champion of 6th Dorjee Khandu Memorial State Badminton Championship-2018, currently underway at the Late Kalikho Pul Stadium at Tezu. Though 4th seeded Sonam put up a convincing fight against Tukum in the first set, he never looked in control in the second and eventually lost it 21-9. With the loss, Sonam had to settle for the silver medal while on the other hand, Tukum, who put up a brilliant show, won gold and retained his number one ranking. The boy’s U19 doubles final saw Kenjom Tacha and Raj Thapa of ASBA defeat the number one seeded pair of Asif Khan and Raja Gupta in straight sets. The popular pair of Asif and Raja failed to restrain the attack of Kenjom and Raj in the first game and lost it 21-15. The second game, however, turned out to be the ‘game of the day’ as both sides went neck-and-neck till the last point. The match that stretched to 28 points ultimately saw Kenjom and Raj get the better of Asif and his partner. The Under-17 category witnessed number one seed Laa Tukum defeat number four seed Kirto Nyorak in sets of 21-16 and 21-13 in the boy’s singles final while Dolma Tamang got the better of number one seeded girl’s player Ingam Potom in the girl’s singles. Like Tukum, Dolma also won the match in straight sets of 21-6 21-13. Dolma also won gold in the U-15 category as she thrashed number 2 seed Kenbi Riram in sets of 21-13 21-11. The final of U-15 boys doubles was also played on the day that saw the pair of Lobsang CS and Suraj Chetry from Tawang defeat Kipa Peter and Rakju Rigia representing Kurung Kumey in sets of 21-11, 21-13. Meanwhile, the U-13 boy’s singles crown once again went to Laa Robin of ASBA who defeated Pakli Bagra in sets of 23-25, 21-13 and 21-9. Though Robin lost the hard-fought opening set 25-23, he made a strong comeback in the second and third to win the gold. Robin, who also contested the finals of the U-15 category, however, could not repeat his feat there as he went down to Nikhil Chetry. Nikhil repeated what Robin did in the U-13 finals and won the match 19-21, 21-13 21-11 to clinch gold. The coveted State level badminton championship would come to a close on Thursday with the remaining final matches being played. Besides other prominent personalities, Badminton Association of India secretary (events), Omar Rashid and ASBA president, Ratu Techi are expected to grace the occasion as chief guest and guest of honor respectively.